For the first time, scientists have developed a computer simulation of how clumps of defective proteins in neurodegenerative diseases like Alzheimer's spread through the brain, much of the time in stealth mode, over as long as 30 years. "We hope the ability to model neurodegenerative disorders will inspire better diagnostic tests and, ultimately, treatments to slow down their effects," said Stanford mechanical engineer Ellen Kuhl, who describes the work in an Oct. 12 article in Physical Review Letters co-authored with Johannes Weickenmeier of the Stevens Institute of Technology and Alain Goriely of Oxford University. The simulations focus on Alzheimer's, Parkinson's and amyotrophic lateral sclerosis (ALS, or Lou Gehrig's disease), but the researchers believe their technique is general enough to work for other brain disorders that involve misshapen proteins, including chronic traumatic encephalopathy. The group knew that each of the three diseases they were studying produced hallmark clumps of defective, misfolded proteins that build up in the brain. To see how those toxic clumps spread over time, Kuhl and her colleagues looked at brain slices taken from people who died after developing one of the three diseases. Prior researchers had stained those brain slices to reveal the presence of the various proteins of interest. When Kuhl's team put the resulting data into a computer, they also did the mathematical modeling to simulate how the pattern of defective proteins spreads from the relatively sparse clumps in people who were early in the disease to much more widespread clumping in people with advanced disease – a process that can take up to 30 years. 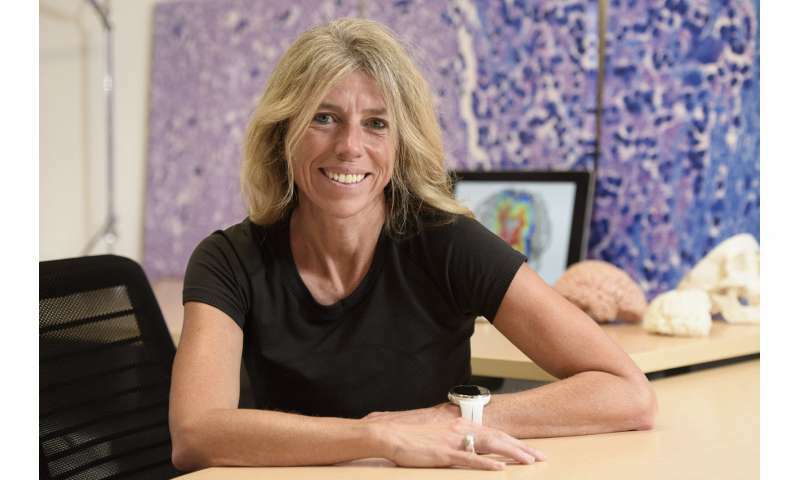 "Imagine a domino effect," said Kuhl, who is part of the Stanford Neurosciences Institute and Stanford Bio-X. "What our model does is connect the dots between the static data points, mathematically, to show disease progression in unprecedented detail." In the case of Alzheimer's disease, the scientists modeled the progression of two misfolding proteins – known as tau and amyloid beta – both of which change shape and form toxic clumps in the brains of people with the disease. Prior researchers had stained brain slices for both proteins and, with the new model, Kuhl's team was able to create two simulations showing the different way that each of these variants of that disease spread. Neuroscientists do not know precisely how one clump of defective proteins affects its neighbors to spread the misfolding, although Kuhl said there are three prevailing theories. The virtue of the model, she said, is that it predicts the path of the disease regardless of which theory is correct. "The real challenge is that cell death from toxic proteins occurs years, if not decades, before the first symptoms begin to show," Kuhl said. Kuhl also plans to make the modeling software freely available to other scientists, repeating what she did a decade ago with similar models to study the heart – work now known as the Living Heart Project. Today, Kuhl said, more than 150 academic and commercial labs are using the Living Heart software to test surgical procedures or design devices like heart valves. The brain software will be known as the Living Brain Project. "Given the aging of the population, by mid-century 135 million people worldwide will have some form of dementia," Kuhl said. "We have to find new ways to spur research toward diagnostics and interventions, and computer modeling can play a key role in identifying new therapeutic targets."